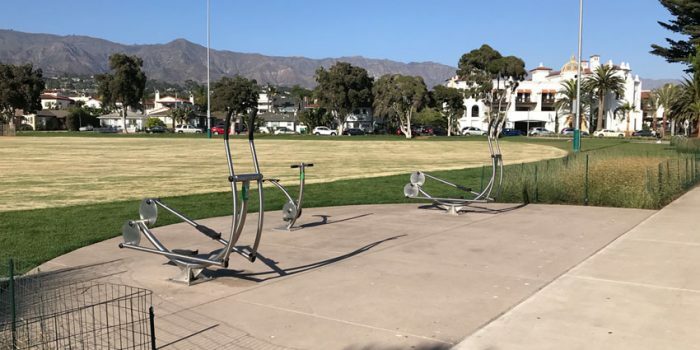 The popular public park, located at Cabrillo Boulevard and S. Milpas Street has received a major overhaul. Access to the park has been improved along with many other amenities including several multi-use grass turf areas and a walking path with views of the ocean. A 1/3-mile health and fitness walking path surrounds the park and the paved path features new outdoor fitness equipment arranged in a circuit along the route. There are 13 pieces of equipment in total, offering a mix of strength and cardiovascular exercises. Use of the park’s outdoor fitness circuit is free and unsupervised; no reservations are required. Half the fun is deciphering the pictographic instructions on how to use the sleek new workout stations. “After many years of planning and community discussion, we are excited to provide a high-quality field and expanded recreation opportunities for residents of all ages,” said Parks and Recreation Director Jill Zachary. Chromatic Gate sculpture by Herbert Bayer remains a highlight of the park. While the walk around the park is relatively short, exploring areas up and down the coastline make it easy to increase the walking distance. DIRECTIONS: Exit Hwy 101 at Milpas Street and turn south or towards the ocean. Follow S. Milpas Street over the railroad tracks and park near the intersection of S. Milpas Street and Calle Puerto Vallarta. ← TRAILS & ART…what’s that all about?